In a new study published in the Journal of General Virology, the research group of Sarin Chimnaronk have engineered the genome of the dengue virus to be able to directly investigate interactions between host proteins and an essential dengue viral polymerase that amplifies the viral genomic material (RNA). Combining with a high-confidence mass spectrometry, this work identified nearly 100 human proteins that interact with the viral polymerase in the context of an actual infection, revealing the first “interactome” of viral replication complexes. Big questions still remain: which, if any, of these interactions are examples of a host defensive response, and which are examples of viral manipulation of the host? Interaction network of dengue polymerase with human proteins is more complicated and shaped than ever thought. 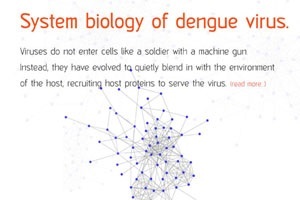 Poyomtip T, Hodge K, Matangkasombut P, Sakuntabhai A, Pisitkun T, Jirawatnotai S, Chimnaronk S. (2016) Development of viable TAP-tagged dengue virus for investigation of host-virus interactions in viral replication. J Gen Virol. 97(3), 646-58.